What do you get if you cross a cuddly blanket with a puppet? Cuddle, CuddleUppets! Blankets that are Puppets! From the makers of Pillow Pets and ShamZees, comes the fabulous range of CuddleUppets, a soft, snuggly blanket that doubles up as a puppet. We were kindly set a purple monkey and I have to be honest and thought that this would be more suited to Roo (yes I know gender stereotyping). However, as it arrived on a day that Roo was at school with Tigger and I at home he spotted it as soon as I opened the packaging. ‘Mine Mummy?’ he asked… how could I say no to the little fella, so off he went. Whilst I was in the kitchen washing some dishes he came through asking for a banana, I handed one over and off he went. 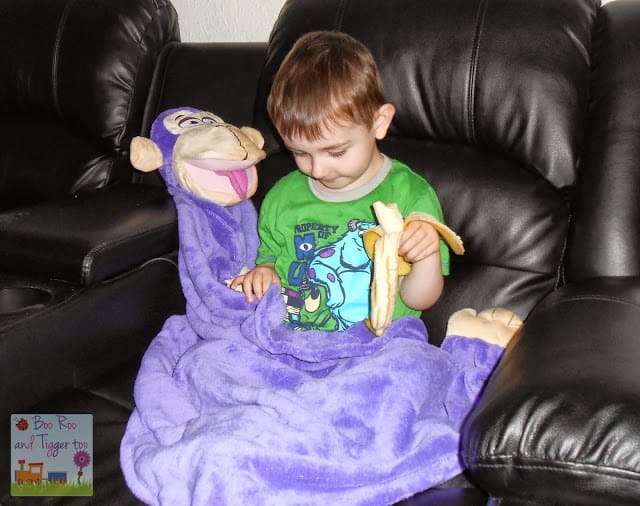 Upon entering the living room I found him snuggled on the sofa with the purple monkey and his banana. Of course when Roo came home and wanted to snuggle up with it Tigger was not best pleased (and so the sibling rivarly begins). I really love the idea of these, a snuggly blanket with a friend attached. Although I showed Tigger that the monkey was in fact a puppet he wasn’t interested, he just thought he’d gained a monkey as a friend. Personally I’m loving the range of different CuddleUppets available, especially the special editions… who wouldn’t want to snuggle up with Sulley from Monsters Inc.? Disclosure Policy: We received a Purple Monkey Snuggle Pets Cuddleuppets FOC for the purpose of review.